A deeper look at the grooves pressed into the Shift and Shadow 12” EP by XIXA. XIXA released its debut full-length album earlier this year (discussion of that release will be coming in the very, very near future) but, now that it’s out and it has had the chance to really establish itself with the indie rock community, some listeners will be wondering what might have come before the “grand introduction” that Bloodline represented. 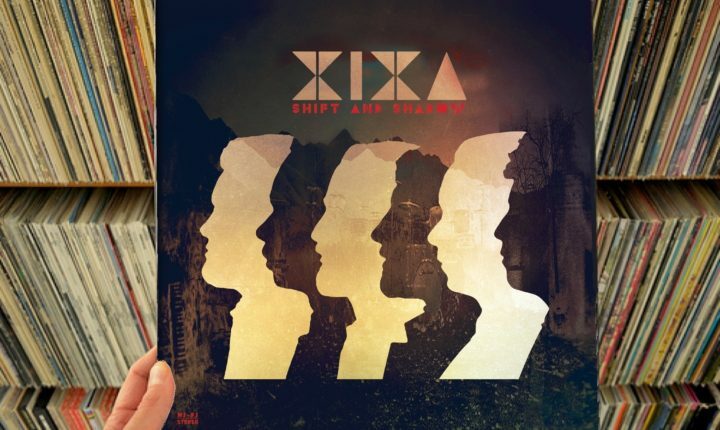 As it turns out, XIXA’a output prior to their big bang is limited but their first release, the Shift and Shadow EP (released last year) is most definitely an excellent, abbreviated preface. As soon as the EP’s title track enters to open the proceedings, listeners will find themselves recoiling not because they find what they’re hearing abhorrent, but because the volume of “Shift and Shadow” is just that initially shocking. Here, guitarist Gabriel Sullivan, bassist Geoffrey Hidalgo, drummers Winston Watson and Efren Cruz Chavez and keyboardist Jason Urman converge on an enormous, positively deafening explosion which incorporates bits of stoner rock, a little Cumbia and a whole lot of balls-out alt-rock power, and the effect is absolutely breathtaking – which is to say that it hits listeners hard enough that that they’ll be left gasping for some. And that’s just the first few bars of “Shift and Shadow.” After that initial salvo, the band pauses for a second and then picks up the cumbia thread in the song to both continue and finish it. As “Shift and Shadow” continues, some listeners may begin to notice that their eyes have begun widening involuntarily at what they’re hearing, because it’s just so damned cool. Throughout the track, Urman’s fine, spidery keyboard line accentuates the minor key guitar figure to create a very dark but anthemic progression which absolutely cannot be denied. Listeners won’t be able to keep their heads from bobbing in rhythm, but the greatest pay-off comes when Lopez’ dark vocal breaks in and instantly colors the song like a thunderhead spontaneously materializing overhead. The singer can send shivers up the spines of those possessed of the right mind as lines like “Shift and shadow the things you know/ The desert’s high on the right/ To the left are all the things that glow/ Blood and fame in the night” snake their way out from between his lips and instantly begin making a few myths. This is truly the sort of thing which sets imaginations reeling and conjures innumerable images, and those images get that much more vivid when the next thing listeners hear is a cover of the Meat Puppets’ classic “Plateau.” Performed in a manner which falls right between the original version and Nirvana’s famous cover, that XIXA’s version of “Plateau” closes the A-side of this EP is just kind of perfect. The combination of “Shift and Shadow” and “Plateau” offers something new as well as a sense of classicism, and leaves minds whirling at the possibility which might await on the B-side of this EP. …And what listeners discover on the flipside is some great, hallucinogenic which could only come from a band who was raised in the desert. Strange little scratches and textures abound in “Cumbia Del Paletero,” but the song is truly hypnotic in a drugged out sense as the cumbia rhythms build beautifully around the song’s melody and the “ballad of beautiful words” angle on the fact that the entire lyric sheet is in Spanish (and, unfortunately, my Spanish isn’t that good). The peaks and valleys throughout the song’s running make for a sublime, alt-worldbeat experience which never lags or disappoints at any point during the song’s four-minute running. After that, “Dead Man” dances out methodically and closes the EP by casting a beautiful spell over listeners which they won’t be able to shake. Even after “Dead Man” fades out, listeners will want more right away; either by flipping the record and starting over or finding a copy of the full-length album that the band released this year. The Shift and Shadow 12” EP is out now. Buy it here on Amazon.